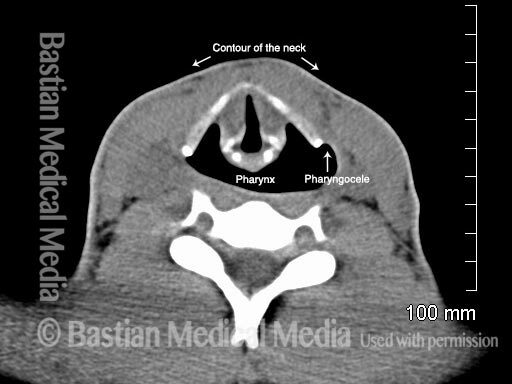 A dilated outpouching from the normal contour of the pharynx. 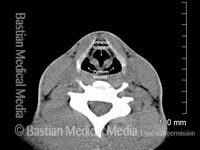 A 20-year-old man complains that his neck expands and that he has pain while playing the trumpet. 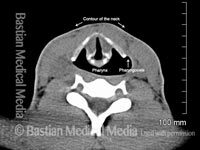 This radiographic image is at the level of the vocal cords, during quiet breathing; at this point, the pharyngeal dilation and pharyngocele are not yet seen. Compare with image 2. Same view as in image 1, except that the patient is performing a Valsalva maneuver, to simulate trumpet playing. Whereas in image 1 the pharynx is completely collapsed, here it is inflated with air. 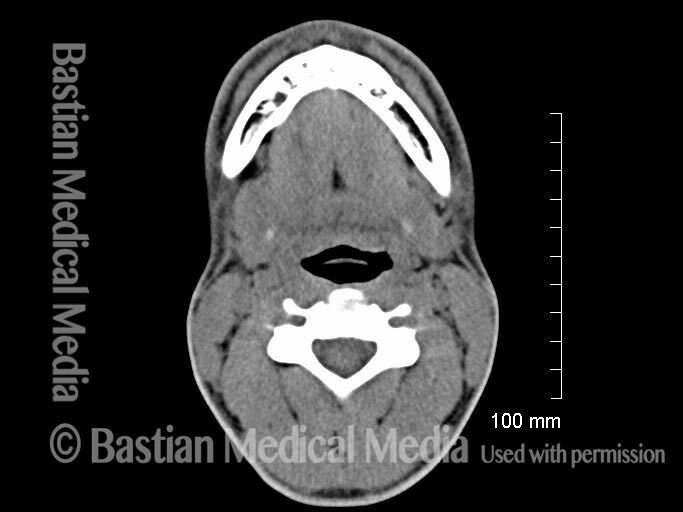 A true pharyngocele, seen on the right side of the image, is beginning to develop. 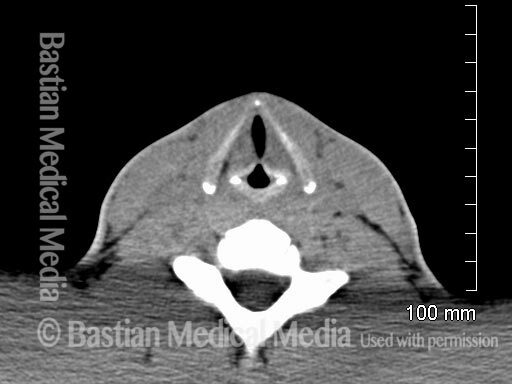 Also, compare the neck’s surface contour between this image and image 1. 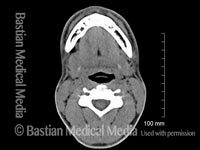 This view is at the supraglottic level, during quiet breathing, and already shows mildly dilated pyriform sinuses. Compare with image 4. 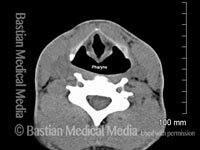 The patient again performs a Valsalva maneuver, during which the pharynx dilates dramatically. Compare with image 3. Higher view yet, at the base of the tongue opposite the tip of the epiglottis, during quiet breathing. Compare with image 6. 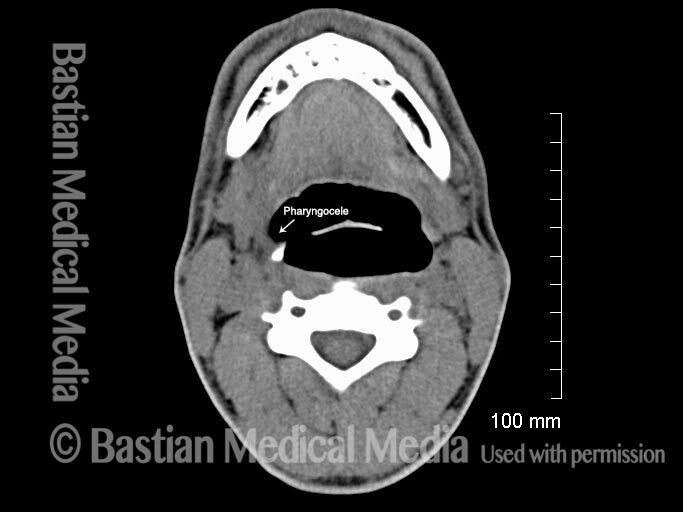 The patient again performs a Valsalva maneuver, during which the hypopharynx expands dramatically; the beginning of a true pharyngocele can be seen again, this time on the left of image. If this young man were to continue playing trumpet, one would expect the pharynx to expand more and more over time.